1953 Brownie Hawkeye Camera, several second exposure, processed in homemade coffee developer, post-processed in Photoshop, including adding Kim Klassen's "silence" texture. Thanks, Kim! Come play with texture in your photos every Tuesday with Kim Klassen's "Texture Tuesdays" ! Use a freely-distributed texture from Kim, and link your photograph here. Check out the links of other photographers, and what they have done with texture, too! 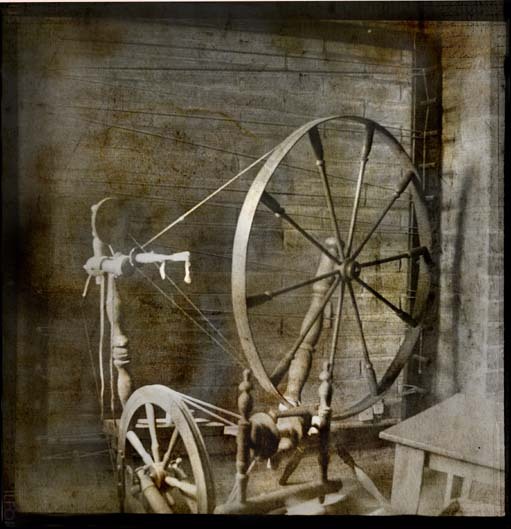 The spinning wheel and loom behind it are on display at the historic Tubac Presidio in southern Arizona. Tubac has been home to different communities over human history, including native tribes, Spanish explorers and missionaries, and colonists. It was established as a military presidio in the 1700s, and is the site of Arizona's first newspaper, The Weekly Arizonian. The Tubac Presidio has been under the management of the Arizona State Parks system for many years, but fell victim to state spending cuts to the parks, and is now being run by citizen groups in the Tubac area. This image is part of my ongoing Arizona State Parks project, where I am photographing as many of the parks as possible with my 1953 Brownie Hawkeye cameras. Hi Jessica, thank you very much for coming and for your really nice comment! There are folks out there who are passionate about making film developers from everyday household ingredients! There are different recipes circulating on the internet that use coffee, or "caffenol", as the term is coined. The recipe I am using contains instant coffee crystals, washing soda (sodium carbonate) vitamin C tablets (crushed up) and aquarium salt. wow~ your photo itself is stunning, but hearing how you created it - wow! impressive and beautiful! Kristy...This is awesome! I was immediately drown to your thumbnail because I have 2 wheels and have spent time in past years spinning. This old wheel is a real treasure and is beautifully captured with your Brownie. Kim’s “silence” is a favorite of mine, and worked so well for you with this image. Stopped by way of Kim's, What an amazing image. Thanks so much, debsea, Genie and Rebecca! Much appreciated! (-: I'm glad to know all of you through Texuure Tuesdays. Wow - all around - photo and mad scientist tips. Thank you Gale and Teresa! Oh Kristy! This photo makes my heart jump! The process, the subject, the love for creating and for handmade goods. That pic looks very anchent!!! Thank you too, Rosie! "ancient" is just what I was after!